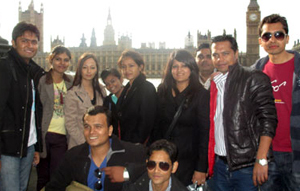 It is a proud moment for Asian Business School (ABS) to share that its student of 2011-13 batch recently visited Oxford & London, UK for the one week residential educational trip. As a part of the curriculum of Diploma in international Business from Oxford Business College, Oxford, and these students did a rigorous comparative research on various management issues related to International Business between India & UK. The project reports submitted and the presentations given by these students to the delegates of Oxford Business College, Oxford were well appraised and applauded. Apart from the academic learning the students explored the cultural & operational norms and values and had a great learning. The visit to historical monuments, markets, London Eye, Buckingham Palace, Big -Ben, Madame Tussaud’s added fun and entertainment in their learning.